Theodore Melfi’s Oscar-nominated drama highlights the early contributions of black female mathematicians to the American space programme. The best sequences in the superbly written Hidden Figures, based on Margot Lee Shetterly’s non-fiction book Hidden Figures: The Story of the African-American Women Who Helped Win the Space Race, involve washroom behaviour. 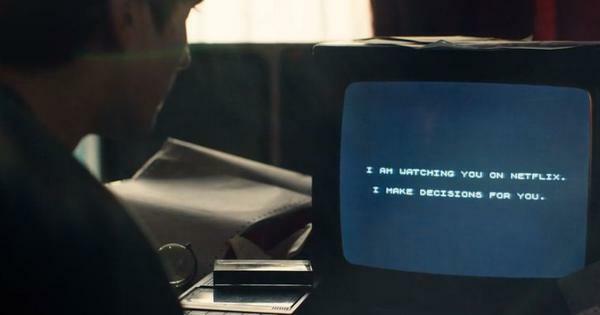 Every time she needs to relieve herself, Katherine Johnson (Taraji P Henson) must skedaddle from her desk at the National Space Aeronautics Administrations office, sprint across the driveway, rush into another building some distance away and dive into its basement. Katherine is a gifted mathematician, whose work on the space programme at NASA will eventually prove to be ground-breaking. But she is also black, NASA is in the segregated state Virginia, and there are separate bathrooms, workplaces and canteens for whites and blacks. When future astronauts come for a visit, the NASA employees are arranged into colour-coded queues, with Katherine and the other black women working as human computers at the end of the line. The repeated motif of Katherine’s toilet visits is a shorthand for the contradictions of American society in 1961. Even as the country tries to catch up with the former Soviet Union and send astronauts into space, its black citizens continue to be held back by deeply embedded racial discrimination on the ground. Are the Russians the real enemy, asks a movie greenlit during the Obama era but most apt for the Age of Trump. 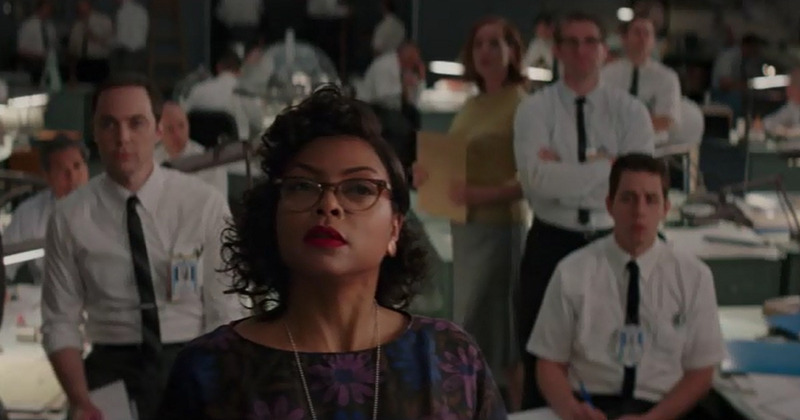 In tracing the contributions of black mathematicians to the space programme, Hidden Figures throws another element into the mix – gender. The triumphs of Katherine, fellow mathematician Dorothy Vaughn (Octavia Spencer), and engineer Mary Jackson (Janelle Monae) are double-edged, best captured in a dialogue exchange after the successful launch of the first American human spaceflight Friendship 7. Now for the Moon, says space programme head Al Harrison (Kevin Costner). We’re already there, replies the moist-eyed Katherine. The screenplay, by director Theodore Melfi and Allison Schroeder, draws a crossweave through the domestic lives of its three female characters, their rise out of the coloured section into spaces that are not ready for them, and the drama at NASA, which is under pressure to prove itself. Costner’s nicely underplayed character recognises Katherine’s worth, and briefly has a white saviour moment over the toilet break issue. For Harrison, the deadline, rather than an acknowledgement of the civil rights movement that is beginning to gather force beyond NASA’s walls, is more important than black empowerment. But even he recognises that integration, not segregation, is what will truly make America great. 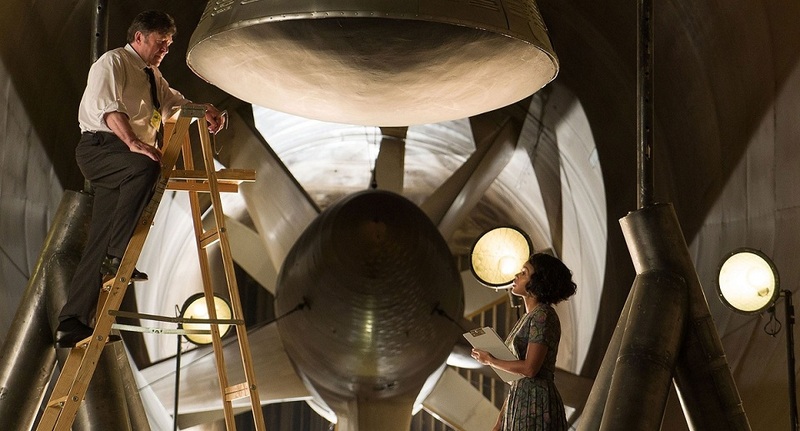 Janelle Monae (right) as space engineer Mary Jackson in Hidden Studios. Courtesy Fox Star Studios. The depiction of the private lives of Katherine and Mary are rose-tinted, but they are also a tribute to female solidarity and a reminder of the struggles that black women face on the home front. A sub-plot of Katherine’s romance with Lieutenant Colonel Johnson (Masherala Ali) is a charming distraction from the ugliness she faces at work, best expressed in the thump of the files dumped daily on her desk by an openly contemptuous colleague. Even though the intertwined upward trajectories of Katherine, Dorothy and Mary never waver, their victories are hard-won. Dorothy’s campaign to be made a supervisor is opposed by her superior, Vivian Mitchell (Kirsten Dunst), while Mary fights to be admitted to an engineering college and earn the degree that will allow her to be employed full-time by NASA. The solid writing, accomplished performances, with Henson and Spencer topping the list, the faithful period reconstruction of the early years of the Space Race (including a reminder of the time when humans were called computers) and Peter Teschner’s skillful editing elevate the drama into something more than an attempt to make an Oscar-baiting and uplifting movie about black empowerment. Just like NASA is feeling its way around space, one rocket at a time, the women in Hidden Figures are launching minor revolutions on the ground, one mathematical formula at a time.